The aim of Cadamà accessible sail boat project is to enable people with disabilities in general and paraplegics in particular to take on sailing, actually putting effort in the navigation while on multiple days cruises. The first step has been to make Cadamà fully accessible through a dedicated gangway. At it’s arrival the lazarette has been brought to deck level and immediately beyond it the cockpit protection has been eliminated. In presence of wheelchairs the cockpit is closed and brought to deck level while the step between the cockpit and the first dog-house has been covered by a ramp on port side. While on cruise cocoons allow shifting between winches, wheel and hatch with the double purpose of locking the crewman in place while working and removing the need for the wheelchair on deck thus keeping a lower center of gravity and improving safety. The hatch has been widened and a lift connected to the stair allows access to the dinette and from here with a second elevator to the Owner’s cabin with a fully accessible bathroom and toilet. For those who can not or wish not to leave the wheelchair two placements, one port side by the hatch and one starboard by the cockpit, have been created. Accessibility on board has been reached through a day by day effort and is in coninuous evolution. Next steps are the kitchen area and the refurbishment of the forward cabins and toilet. 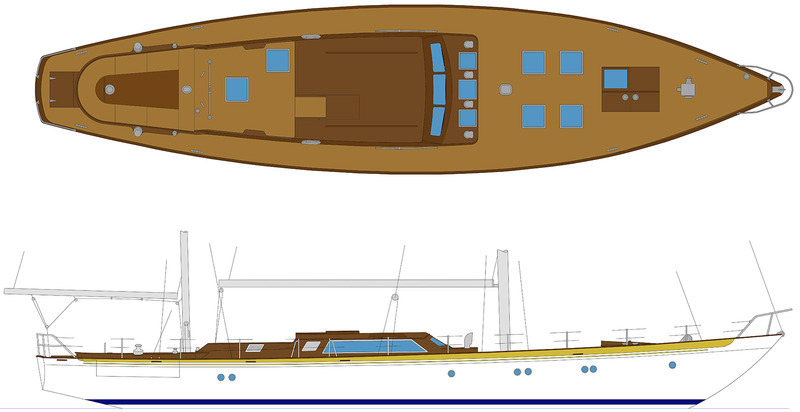 Project details – belowdeck, sections and lift details. Highlited in red are the accessibilty works. From the hatch a lift will get to the ward-room, a second lift will give access to the forward cabins while a simple ramp brings to the Owner cabin. All doors have been enlarged and toerails eliminated.